The Efest PRO C2 Charger is a two bay charger that is user friendly and easy to maneuver. It’s known for being one of the more cost efficient chargers, and is a great way to charge your batteries. It has a LED indicator light that turns red when your battery is charging and green when the battery is fully charged. 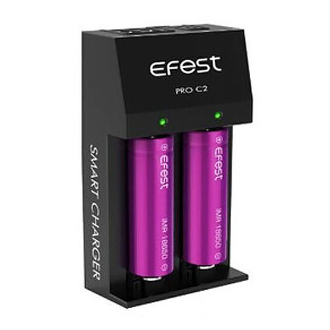 The Efest PRO C2 Charger can charge many types of lithium batteries even ones for electronic cigarettes, flashlights, electric tools, etc.